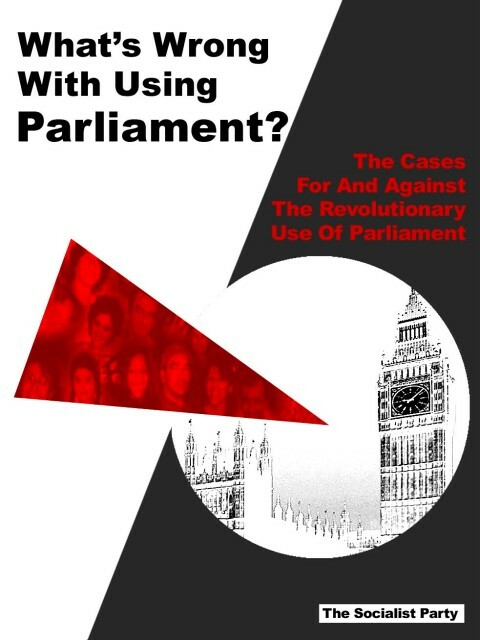 Review article of “What’s Wrong with using Parliament?” by The Socialist Party [of Great Britain], 24pp July 2010, £1.00. In the light of the referendum on a change in the voting system (see "The alternative vote referendum..." ) we thought we would take another look at the only genuinely socialist organisation which attempts to sell us the parliamentary road to socialism. Over the years we have debated the issue of how we will get to a socialist society several times with the SPGB (1) in both meetings and our press. Indeed several people have contacted us after listening to a tape our 1994 debate which you can still buy from the Socialist Party. Last year they brought out a new short pamphlet, What’s Wrong with Using Parliament?, to restate their belief that socialism can only come about via parliament. It is that which we are reviewing here. The reasons for debating with them, and not other parties claiming the title “socialist” is not simply because they have a culture of debate (propaganda and education are their main activities) but because they share with us a real understanding of what socialism is. Unlike the Stalinists, Maoists and Trotskyists they do not believe that some form of state ownership of the means of production is socialism, or even a step towards it. Like them we are “an organisation of equals. There is no leader and there are no followers”. (Introducing the Socialist Party at the beginning of the pamphlet). But differences over how socialism can be achieved have dug a chasm between themselves and revolutionaries. This pamphlet only underlines that distinction. what better way is there to challenge that “democracy and freedom” than by using the accepted legitimate channels and thereby be able to call [liberal democracy’s] bluff. Socialism cannot come through the Parliament. If we look at a country like Chile we can see why. In 1973 the people elected a moderate socialist government led by President Allende. This democratically-elected government was toppled by a CIA backed military coup. Repression followed in which the workers movement was smashed and thousands of militants lost their lives. Gaining control of the state will at the same time give control of this social organ which can be used to co-ordinate the changeover from capitalism to socialism. Of course, it couldn’t be used in the form inherited from capitalism. Like so many caveats the last line is meaningless if you do not actually say that the first thing the workers will have to do in the course of their revolution will be to smash/dismantle the capitalist state and its organs of repression. This argument is an old one as the founding Declaration of Principles of the SPGB (printed a the back of the pamphlet) also argue that all they will have to do is have the state, the machinery of oppression “converted” and it will guarantee workers’ emancipation. For the SPGB winning a majority in parliament is the same as gaining control of the state (p.7) but how different do they think the scenario will be to that in Chile? Allende lasted 3 years because he was slow to move against the old state apparatus. If he had acted faster his government would have not have lasted as long. The point is that the state has to be destroyed in the course of the majority taking over, not via a parliamentary majority after a leisurely debate. Waiting to gain such majority will only allow those who hold all the reins of power to prepare their various contingency plans. The SPGB are also so desperate to assert the importance of parliament that they attempt to deny that bourgeois state power lies elsewhere. When Class War argue that the real power of the state lies in the organs of repression, the permanent bureaucracy etc they are accused of “conspiracy theory” which then can be called “absurd”. But the spontaneous bowing of parliament to the needs of capitalism is plain for all to see and the SPGB accept this on p. 17. You don’t need a conspiracy theory to see that vested interests via lobbying, and think tanks set the agendas and define the limits of policy (one reason why any attempt to reform anything under capitalism sinks in the mire of its own contradictions). Political donations, control of the media, appointments of MPs and ex-Ministers to company boards etc are all part of the way in which capitalism ensures that capital dominates the political agenda. For the SPGB this is irrelevant since for them parliament is the main state organ and thus when they get a majority all these extra-parliamentary organs (including the armed forces and the police) will be so stunned by socialist argument and parliamentary legitimacy that they will be neutered. There are other ways in which the SPGB don’t seem to take on the reality of what they are proposing. If they are for pure socialism (and we believe they are) what are their non-reformist minority MPs going to do whilst awaiting the time when they have 300 plus members in parliament (currently they have none and never have had one) to vote capitalism down? The people who elected them will expect some results in the course of a parliament, unless of course they no longer count on parliament, but then that begs the question as to why did they vote at all. Our new SPGB MPs will arrive in parliament to take the loyal oath to Her Majesty the Queen, and then what? The only concrete activity that the SPGB put forward is that they can use Parliament as a tribune to denounce the system. And after 5 years of doing that they expect to win a majority the next time round? They criticise the anarchists for putting forward “unrealistic alternatives” but nothing seems further from reality than the SPGB’s cosy view of the capitalist political system. The Anarchist Federation, for example, are castigated for envisaging the possibility that the capitalist class will actually put up a fight to defend its property (p.20)! It is clear that what the SPGB stands for is social pacifism and what they stand against is genuine class action. Capitalism will be safe for ever with these comrades. In fact, what characterises genuine class action is beyond the SPGB. On p.19 they quote the Anarchist leaflet “What is Anarchism?”. The authors of the ‘What is Anarchism?’ web-page leaflet mentioned above, which claims that “socialism cannot come through parliament”, agree with us that the revolution against capitalism must be a majority, participatory revolution. Central to our politics is the belief that ordinary people must make the revolution. Every member of the working class (workers, unemployed, housewives, etc.) has a role to play. The trouble is they don’t seem to have thought through the implications of this. If on the eve of the revolution a majority of the population are in favour of it and are organised to participate in it, why should they not demonstrate this by putting up their own candidates to oppose and beat those who do support the continuation of the capitalist system? Naturally, these candidates would stand as mandated delegates not as unaccountable representatives. Being the majority, this would be reflected in a majority of seats in parliament. And if some pro-capitalists in the boardrooms, the armed forces or the police attempted a coup, what, as already pointed out, could they do against a participating majority committed to establishing socialism? Once there is an organised, determined majority the success of the socialist revolution is assured, one way or the other. It is then a question of the best tactic to pursue to try to ensure that this takes place as rapidly and as smoothly as possible. In our view, the best way to proceed is to start by obtaining a democratic mandate via the ballot box for the changeover to socialism. The tactical advantage of doing this is that, when obtained, it deprives the supporters of capitalism of any legitimacy for the continuation of their rule. This is the Monty Python path to socialism. The Anarchists talk of “revolution” as a single process (in our view, an error) but at least they see it as starting a process. The SPGB cannot conceive of a “revolution” until 50% plus 1 of the population is ready. For them “revolution” is a quiet vote, a polite discussion in parliament and the change in ownership of the means of production by legislative enactment? A splendid “tactic” which does not even actively involve most of the working class! But here we are entering a Lewis Carroll world where “words mean what we say they mean”. Revolutions are certainly about more than change in government. They are fundamental shifts in class relationships and they either change the basic way we produce things or they fail. They are also messy unpredictable things but you would not think so reading this pamphlet. In fact the pamphlet is entirely devoid of any reference to real struggles of real workers. It is a utopian plea to participate in the arena where the ruling class is strongest in order to defeat it. However the SPGB are absolutely certain that only they hold the key to the future of the working class. Anyone who advocates anything different is “unrealistic”. It is dangerous and futile to follow those who support violence by workers against the armed force of the state. Violent revolution has sometimes meant different faces in the capitalist class, always meant dead workers, and never meant the liberation of the working class. Unless workers organize consciously and politically and take control over the state machinery, including its armed forces, the state will be ensured a bloody victory. Political democracy is the greatest tool (next to its labour-power) that the working class has at its disposal. When the majority of workers support socialism, so-called "revolutionary" war will not be required. The real revolution is for workers to stop following leaders, to start understanding why society functions as it does and to start thinking for themselves. Between voting and violence there is nothing for the SPGB. In reality the very nature of capitalism is constantly throwing up class conflict even at times of relative class peace. They see workers coming to understand the need for socialism only by “thinking for themselves” as individuals. This is the same appeal the capitalist makes in trying to stop workers take class action. In reality workers always “think for themselves” but they think different things at different times. When capitalism guarantees them a reasonable livelihood they accept it, and its media claims, to be the best of all possible worlds. However when the system begins to fail and enters into one of its periodic crises workers begin to “think for themselves” but not necessarily individually since their common experience begins to teach them more than all the lectures of the SPGB (or anyone else). This does not mean the end of the system but it does lead to collective resistance on an initially economic level. There is no mechanical link between the economic and political struggle (on this we can agree) but the struggles themselves have the potential to plant the germs of conscious opposition to capitalism. In some cases this consciousness takes political direction and this leads to the formation of class political organisations who make it their task to articulate the lessons of past historical achievements of the class. In doing so they help to define the communist programme. History suggests that this does not come piecemeal but rapidly. Even those who have been expecting it will be overwhelmed by its force. In the course of it the movement may be peaceful (the bigger and more widespread the more peaceful it is likely to be) but even an overwhelming movement such as in Cairo may have to be extraordinarily courageous in the face of last ditch fight to the death by capitalists defending their property. The collapse of the forces of the state under this mass pressure is the best scenario for the collapse of capitalist order in any one area. ... revolution is necessary, therefore, not only because the ruling class cannot be overthrown in any other way, but also because the class overthrowing it can only in a revolution succeed in ridding itself of all the muck of ages and become fitted to found society anew. In contrast to the passive role of the voter under capitalism people will become, to use the words of the Anarchist Federation (quoted in the pamphlet), “energised”. It is only at this point when the old ruling class is on its knees that the implementation of a real socialist programme by the immense majority will be possible (provided that active within this movement are those campaigning for it). want a classless, stateless, wageless, moneyless society based on common ownership and democratic control of the means of life. (1) Although it has since shortened its name to the Socialist Party, the Socialist Party of Great Britain still retains the full title in some circumstances so we will call it the SPGB here. It is not to be confused with its SPGB’s splitters, the Socialist Party of Great Britain which produces Socialist Studies [for our debate with them see “The Fairy Story of the Parliamentary Road to Communism” in Revolutionary Perspectives 39] nor the Socialist Party of the former Militant Tendency after it was expelled from the Labour Party. Good piece liked the irony in highlighting the SPGB futility of beleiving that there could be a parliamentry road to socialism/communism. The bourgeoise tolerates parliament as long as there is social peace. When the class struggle heats up and goes beyond the boundaries of both Labourism and Trade Unionism then the bourgeoise will have no hesitations in abandoning parliament. More than likely the Labour Party and Trade Unions would go along with their own suspension. What surprises me however is that you regard the SPGB as being somehow revolutionary when even their rhetoric is confused and contradictory. Its no accident that they see the Russian Revolution of 1917 as being no more that a Bolshevik coup d'etat. Nice try, but how seriously can we take a 'review' that gets it so badly wrong in the first paragraph (not to mention every other paragraph)? The Socialist Party does not believe "that socialism can only come about via parliament", as explained quite clearly in the pamphlet. Rather, it believes that socialism can only come about as the conscious decision of a majority of the working class. And, given that, elections are one way, and, given present conditions, the safest and most sensible way, of propagandising for socialism (in the short term) and demonstrating majority support (in the long term). If conditions change, then the pamphlet mentions other ways of demonstrating majority support – demonstrations and strikes, for example. Similar caricatures ruin the argument in the rest of your piece, sadly. People wanting the true story will just have to read the pamphlet. I am a slave. I belong to a collectivity of masters. The masters tell my fellow slaves they are not slaves, they give them certain benefits in return for their labour and most remain docile in their slavery. But some of us rebel and simply do not want to be slaves. We encourage others to rebel and fan the flames of resistance wherever they occur. What the majority of our fellow slaves believe does not matter, we know we are slaves and we do not want to be slaves. Every struggle represents an opportunity to break down the slave system, set up working class organs and escalate into a revolutionary contest. The revolutionary movement itself is the key to revolution, the minority of revolutionary slaves win over a sufficent mass of the passive slaves to take on the masters. Absolute figures mean nothing, the only concern is to destroy slavery. Either our fight sparks off an escalating conflict or once again we go under. Of course it matters what our fellow slaves believe. Spartacus? Yeah, he's that one over there mate. I believe in each man for himself. The pamphlet was sold to us by SPGB comrades last November who told us it was their latest statement about parliament (from last year) but you would need a Diogenes lamp to interpret it in the way you suggest. There is no "quite clearly" about it. The references to other forms of struggle are clearly intended as mere adjuncts to the real business of winning power via parliament. We are interested in open and honest debate which does not make unsubstantiated criticism of any other other group or individual. If the SPGB really does have a different approach we will gladly print it. But if it comes to caricatures no organisation is better than the SPGB (and it runs right through the pamphlet in the misrepresentations of the arguments of the Anarchist Federation (lovers of violence), the IWA and even Class War [conspiracy theorists]). We have our differences with all these but we can see that their positions are being distorted in your polemical defence of parliament as the real source of power. We dealt with it quite gently (as Dave above suggests) but, as you say, people should read it for themselves to fully understand the feeble argument it puts forward. Well, just to make sure, I reread the pamphlet last night, and I stand by everything I said. So yes, as you say, people will just have to read it and decide for themselves. But as an example, let's briefly compare a comment of yours with what is actually said in the pamphlet. Mind the gap. You say: "The references to other forms of struggle are clearly intended as mere adjuncts to the real business of winning power via parliament." We say (in the pamphlet): "... the majority's organisation for socialism will not just be political and economic, but will also embrace schools and universities, television, film-making, plays and the like as well as interpersonal relationships. We're talking about a radical social revolution involving all aspects of life." And what do we use as historical examples to back up our view of majority support leading to relatively peaceful change? Things like the collapse of the state capitalist dictatorships in Eastern Europe in 1989-90. If what you are saying is correct, we would surely have dismissed such things as irrelevant to "the real business" of winning power through the ballot box. This is a very well written pamphlet and it describes many aspects covered by Marx in regard to the participation of the working class in the parliament. It was Marx who considered that the parliament was one of the strongest tool that could have been used by the world working class. The pamphlet does not say that the parliament is the only tool that can be used, therefore, the review made is not very honest. In one comment one participant questioned the revolutionary stand of the Socialist Party of Great Britain ( and the World Socialist Movement ) but it looks like that person has not read or studied the history of the SPGB and the WSM, because we have always taken a revolutionary stand in all issues and we have not taken any reformist stand during a period of more than 100 years. I meant it in the context I wrote it - What the majority of our fellow slaves believe does not matter, we know we are slaves and we do not want to be slaves. that most workers do not question the fundamental existance of capitalism does not confer upon it any legitimacy, our perspective is not based on any ephemeral majority view which may in fact swing to a more reactionary extreme than the ruling class regarding certain issues. I think that there is no legitimacy, pluralism etc under capitalism, we have a ruling class dictatorship camouflaged as best as they can. Neither would I have any qualms about winning over a majority of the working class or the population in general before smashing the ruling class and generally giving them hell, terror, devastation. If the working class can establish its councils and they accept the need to take the power that is sufficent. If many workers do not participate in the councils, that is their choice. the opening shots might not necessarily have absolute majority support, but that would not stop the determined workers from succeeding. What will happen remains to be seen, but there is no fairness under capitalism and we will grab the opportunities presented. Stuart You are equivocating. When we talk of the the overthrow of capitalism we are talking about the initial act of the revolution. The pamphlet only sees that initial act as coming via parliament. Your quote deals with the subsequent revolutionary process in which every aspect of life will have to be changed (and here we would be in agreement). Anonymous (funny how he's a member of every group that posts to us) should read the review. We actually said the pamphlet is well-written and we did not call the SPGB "reformist" (something you infer from another poster (Dave) who actually said that we seemed to regard the SPGB as "revolutionary" [which we don't given your position on parliament] but we don't lump you with the reformist capitalist Left either. As to Marx as the upholder of the parliamentary road to socialism his comments on this are at best tangential and can be interpreted differently in different contexts. What is consistent in Marx is the "revolutionary". I am sure we all agree that socialism cannot be built as an alternative mode of production unless it is by the active participation of the mass of the working class. But the question of how we turn workers today from being passive (if not totally apathetic) citizens into an active collective building its own future is what separates us. For the SPGB the road can only come via a parliamentary process in which the working class is educated via your propaganda as to what socialism is. But for Marx in the German Ideology it was the revolution itself which changed men and women's minds on a mass scale. It occurs to me that the German Ideology was not published until the 1920s (i.e more than 20 years after the SPGB was founded) and its insights make uncomfortable reading for those who think that the overthrow of capitalism begins via the ballot box. Cleishbotham said: "It occurs to me that the German Ideology was not published until the 1920s (i.e more than 20 years after the SPGB was founded) and its insights make uncomfortable reading for those who think that the overthrow of capitalism begins via the ballot box.It occurs to me that the German Ideology was not published until the 1920s (i.e more than 20 years afte the SPGB was founded) and its insights make uncomfortable reading for those who think that the overthrow of capitalism begins via the ballot box." I have nothing substantive to contribute, just a trivial note. I remember reading somewhere that an SPGB agitator (or should that be educator?) was confronted by a syndicalist who demanded to know of him did he really think socialism would come through the ballot box, his reply was no it would come through the brain box. The links posted above are the audio recording of the contribution of a spekaer for hte CWO. Unfortunately I could not find the audio reocrindgs of the others contributions. If any one knows of where they can accessed online it would be good if they would post the links. When we talk of the the overthrow of capitalism we are talking about the initial act of the revolution. The pamphlet only sees that initial act as coming via parliament. No, if anything, the final act. For the SPGB the road can only come via a parliamentary process in which the working class is educated via your propaganda as to what socialism is. Why not stick to a criticism of what we actually believe? You must know that this is not true. Don't you? But for Marx in the German Ideology it was the revolution itself which changed men and women’s minds on a mass scale. It occurs to me that the German Ideology was not published until the 1920s (i.e more than 20 years after the SPGB was founded) and its insights make uncomfortable reading for those who think that the overthrow of capitalism begins via the ballot box. I've read it and I wasn't at all uncomfortable because I agree with it. You can wriggle and twist all you like, but the plain fact is that both Marx and Engels, towards the ends of their lives, approved of the idea that the working class should use the ballot box to come to power. It's a simple and plain fact. You don't have to agree with Marx and Engels, of course, but you can't change the facts. I especially like Steve Coleman's contributions. There is nothing in this pamphlet that we have distorted. It is you who are wriggling. If the pamphlet does not fully give your views then stick a quote from any other publication here to disprove what we say (as we are not determined to either distort positions or argue about nothing with anyone). The pamphlet not only does not deal with the issue of class consciousness but does not even mention Marx or Engels or even argue against those Marxists who disagree with you. We know that in the 1870s Marx and Engels did discuss whether under certain particular circumstances workers in GB, Netherlands and the US might arrive at socialism via the ballot box but this was not the main thrust of their arguments especially after the Paris Commune. On the other hand would you deny that they denounced "the parliamentary cretinism" of certain sections of social democracy or that Engels never complained that Leibknecht had distorted his views in Vorwarts to make him appear like a lover of constitutional change? He left in acrimonious circumstances I was told by one of your main spokesmen. You need to speak to your own comrades I think. It seems you have a tendency to read things that aren't there. I'm not a member of the SBGB or indeed any WSM party. My only connection to them is that I'm on roughly the same wavelength. Regarding Coleman, I understand he wrote a letter to the party some 25-or-so years ago criticising the tendency for branches to form cliques. If that's what you're talking about, then I'd hardly call that 'ratting on them' given that you can find more than enough complaining about it on their internal discussion forums which, in typical SPGB style, are open to everyone. I don't want to outstay my welcome or seem to be badgering or hogging your own website, so I'll make this my last post. If you'd like to continue the debate, then of course you know our attitude to debate and where to find us! The point I want to conclude with is that I would like to hear criticisms of our actual position. I don't want to hear what we 'really' think, or that when we say something that contradicts you then this is 'merely' an 'adjunct', or not the 'main thrust' or whatever. So, for example, I am used to hearing that the SPGB believes that socialism can only come through parliament, that any activity outside of parliamentary activity is a waste of time, that socialism can only come when the workers have been educated into the right ideas by the SPGB, that for us class struggle is an irrelevance compared with propagandising for socialism, and so on. All very amusing, but all absolute nonsense. The best short statement, in my opinion, of the political views of the SPGB is contained in the article I linked to above, 'Anglo-Marxism – the SPGB'. We believe that socialism can only come about through the activity of the working class itself; that any activity outside of parliamentary activity is to be welcomed, if it is on sound, class lines, but that the SPGB as a party should not try to dominate or interfere except as individuals in solidarity with the rest of the membership; that education is a vital aspect of the struggle, to which we hope to make our own unique if small contribution; but that this propaganda work, however important, pales in comparison to the development of the class struggle, including the intellectual development of workers through their own self-education; that to establish socialism the working class must take political power, and that the most obvious and sensible way for them to do this, in democracies, is to use the vote (a view that can't be all that silly given that Marx and Engels agreed with it). Sure, disagree with it. In the past, I have. But please don't pretend we say something different to what we actually say, or that what we actually say is some kind of irrelevant apology for what you want us to say (but don't). I thought that the SPGB is if not opposed to strikes then does not look all that favourably upon workers going on strike. So how does this tally when you say the SPGB supports the class struggle. Hope you do reply as it does interest me, I'm not a member of the ICT. As far as I know the SPGB is supportive of workers taking action to defend or extend their interests (pay and conditions), but as a Party does not take part in organising such actions. It may well be that individual members, as trade unionists, are involved in these actions, and there are examples of that in the Party's history and that of its Companion Parties. As Stuart says, the SPGB’s role is chiefly one of education / propaganda, with some electoral activity as well – all of which is part and parcel of the class struggle. It recognises that it's inevitable that workers should resort to strikes etc in order to protect ourselves from capitalism's assaults, but that these actions by themselves are not going to put an end to the wages system. Many of our members are also members of workers union and they provide support to their own union. Our principles are very clear, we do not want to prolong the wage slavery, and we do not promote a better pay, which is only a capitalist reform, we want the total elimination of the wage system, because our immediate and future program is socialism, but we support any gain that might temporally benefit the working class. All I will say in response to Stuart is that this is a review of an SPGB pamphlet. In no part of it does it suggest that the overthrow of the ruling class can come about via anything other than parliament and indeed misrepresents the anarchist organisations it chooses to quote (in particular the AF) for suggesting otherwise (in my view in that deliberately misleading way the SPGB always uses - Coleman's dishonesty about our positions in the debate was the thing I remember most about the 1984 debate). Anonymous shares the tendency to dishonesty with his final paragraph about "the left winger". Who is he referring to here? Certainly not ourselves who focus on the working class in the means of production and distirbution but only because that is where its real strength lies and where it has the capacity to rediscover its class identity. "Thanks for that reference (would that Steve Coleman be the professor who ratted on the SPGB subsequently?) as people can then judge for themselves from the full debate (if they have the stamina)"
I was in the same SPGB Branch as Steve when he left the SPGB. He simply lapsed his membership. You can speculate that he was burned out or browned off but to the best of my knowledge he never "ratted" on the SPGB. And neither did he did leave in "acrimonious circumstances". Glad to hear from you and I don't want to derail this thread into a discussion about one ex-member of the SPGB but I was only repeating the comment of one of your own leading members. I don't want to give more details (as the same person may now regret what they said) but it was certainly uncomplimentary. I had the impression that Coleman distanced himself from the party in order to further his academic career (in fact I nearly referred to it in the bit in the pamphlet where it assumes that SPGB members (reinforced by a clear conception of socialism) will never be seduced by power if they get to be MPs. A rather naive suggestion in my experience. As it is in the debate in 1984 (which I am quoting from memory) he dishonestly refers to positions which are not ours and when we tell him that this was not the position of the CWO (although it had been of one of our constituent elements in their early days) he uses that like some US attorney prosecuting a case - not like someone taking part in an honest debate to understand (even if we still reject) each others' positions. As to Stuart's comment above I still don't understand. How can we be inaccurate by insisting that the SPGB is based only on the parliamentary road to socialism if the PARTY only supports that one strategy whilst passively accepting that there may be others? that Marx and Engels supported use of parliament or any other position certainly means we should give the matter careful thought. However it does not follow that we accept without question what was written in another historic period and that "invariance" is necessary. Despite a material reality which we, the revolutionary minority, evaluate as ripe for socialism and in the interests of the overwhelming majority who suffer the negative effects of capitalism's trajectory, we remain isolated from the class and broadly unable to disseminate our ideas. Today, the ruling class has refined a multiplicity of means at its disposal to instil its world view into the minds of those who, we consider, would benefit from abolition of capitalism. form school to church, from newspaper to television, political parties to trade unions, the entire edifice of capitalism bombards the working class with its unquestionable logic. We on the other hand, have, in comparison, virtually no means to disseminate our ideas. The ruling class parties are massively funded, including trade union funding which seeks to retain the very real material benefits for the trade union bureaucracy. Media is a business promoting business. In a very real sense, the democratic door is firmly shut by the property qualification. Modern capitalism is dependent on this vast array of ideological weapons, and material ones like welfare, to a far greater extent than was the case almost 200 years ago. It is the scientific reality that socialism can refer to which explains its continued survival against all the apparatus of capitalist opposition, a material reality that demonstrates the inner contradictions of the system and the inevitable crisis they produce. Periodically the crisis unleashes a volcanic wave of struggle that is the soil for the minority who have managed to maintain themselves above the capitalist assault on consciousness to intervene. This intervention is explosive because it is tied to the workers struggle which only reaches acute levels on rare occasions and does not allow for a gradual winning of support at the ballot box, but can only be decisive in the particular circumstance of the marriage between the revolutionary theory and the organs of proletarian power which are only born in acute struggle and remain subjugated to the ruling class organs until they take on board the revolutionary demand to take power and abolish the ruling class structure. The window of opportunity is limited and passes very quickly, but for a brief moment the enemy is vulnerable and we are able to overcome the beast. Could we also consider that the massive rate of abstention and the fact that ruling class parties are under ever greater pressure to hoodwink a vote out of a significant sector of the population also counts for something and that abstentionism is a socialist way of influencing the "electoral barometer" ? I'm not to certain that I fully agree with Stevein7 when he argues that ideological dissemenation of capitalist ideas is more powerful than they were 200 years ago due to the overwhelming and multifaceted means of communication. While it's true that the trade unions are now more open in their dissemination of capitalist ideas than they were in the past they were still obstacles to socialist ideas even in the comparitively recent period. Also lets not forget that socialist ideas have alwaays been disseminated by a minority through a combination of papers, leaflets and word of mouth. The bourgeosie have always had the upper hand yet this did not stop socialist ideas gaining not only a hearing but also a following larger than today. The reason why socialism/communism has less influence today than in the past has very little to do with ideological dissemination and more to do with the success of the bourgeoisie in the class struggle during the last thirty years. This led to a demoralisation and a depression amongst workers that socialism is possible and even desireable. However with the onset of the 2008 crisis and the impact of this crisis on workers lives then we have for the first time in a long time the possibilty and thius is what it is a possibilty of recruiting workers to socialism/communism. So I am less pessimistic that Stevein7 appears to be and beleive that with a bit of work and a bit of courage we can begin to build a genuine revolutionary party. The failure of achieving this is to horrific to contemplate. I would agree that it is more than ideological factors, sophisticated management of the crisis has prolonged capitalism's shelf life and this has at least in part been acheived by the negation of the original laissez faire capitalism of Marx's day and the rough edges have in some cases been smoothed, but this has simply stored up greater problems further down the line as the contradictions continue to expand and capital is unable to accumulate without inflincting massive social devastation, the likes of which we are currently seeing. Nor was I being particularly pessimistic, I am in fact saying that isolation and relative obscurity of the revolutionary movement is to be expected, not a point of despair, and that in correct circumstances we can exert decisive influence. I was listening to the forum debate on the SPGB website and it seemed to me that the SPGB was treating the debate as though they were debating with the ICC or some Trotskyist group. Their entire tone was a hysterical cry against horrible "leninist" elitists out to run a "transitional state" dictatorship. It was as if our comrades were in the same room trying to have a logical debate and the SPGB supporters were busy arguing against against a panel of straw-men. Ironically, the SPGB is supports the same approach to the use of elections that Lenin advocated, the use of the capitalist election as a platform for reaching workers with socialist propaganda. The SPGB is supporting a tactic that is far more classically "leninist" in that respect. At least Daniel Deleon and the SLP in the States supported electoral politics and worker organization albeit in "socialist industrial unions". The SPGB reminds me of Deleonism without unions. The SPGB treats our critique of parliamentarism as though we are saying that workers are too "thick" to vote in their best interests, which I'm assuming means voting for the SPGB. The irony of this is that by voting for the lesser of bourgeois evils, as opposed to voting for the SPGB, the workers are voting in their interests as best as they are able within the framework of capitalist democracy. Workers don't do this because they are "thick", but because it is the only way they see to promote anything close to their own interests. For a capitalist fooling citizens to vote in an election is as simple as demolishing one's opponent and convincing enough people for only so long as it takes to get them to the polling places. The capitalist politician doesn't need to set about permanently convincing every citizen-voter on the need for capitalism, while the SPGB is confronted with the need to permanently convince every worker-voter on the need for socialism. The main obstacle to the overthrow of capitalism is ideological. It is not only the technological capacity to disseminate ideas that has been refined but the efficacy with which these ideas are communicated and the traction these ideas have with most people. Class consciousness presupposes a radical change in people's systems of understanding and the ways in which they ascribe value. This quasi-religious mass awakening is in no way guaranteed by a deterioration of people's quality of life. If anything, most people will beg for things to be as they were and will shun change preferring the comfort of totalitarianism. For real change to occur during the acute stages of crisis there needs to be a dexterous and capable minority that is able to adapt to the changing seas of struggle. It cannot do this if it's actions are mediated through a highly formalized and inflexible institution such as parliament, which is propped up ideologically and materially by the bourgeoisie. Overemphasis on parliamentary process is self-defeating. Time would be better spent agitating for class struggle, not attempting to reach the ivory tower of parliament, which would be almost useless even if it were possible. 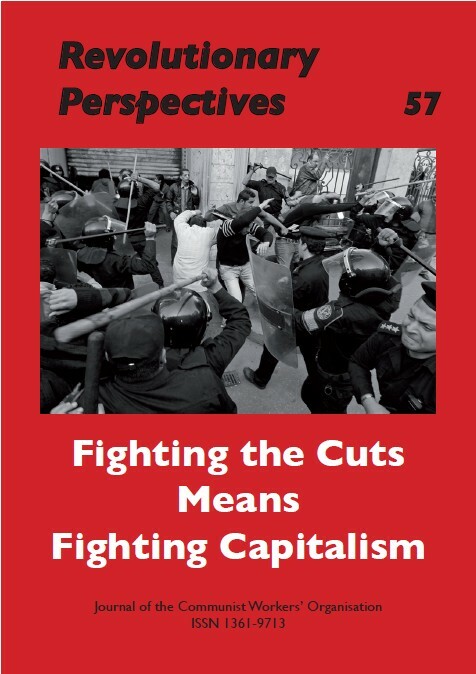 I found the pamphlet on the SPGB website, freely available. Well, that's good of them. Anyway, I thought that the missing factor, which is the key to this, is that of the workers' councils, the soviets. The glorious day scenario of the anarchists where workers just take over, the supposed Leninist coup whereby the ruthless few somehow get to power were looked at, but the historic reality of the workers' councils seems to be missing. It's a common enough theme. Either the spontaneous workers or the repressive elite, but the way we see it is that the working class will in the heat of struggle construct their own organs of authentic mass expression, organs which will have to evolve rapidly in a turbulent situation and it is these that will give legitimacy to the socialist movement, not the formal organ of parliament, the bourgeois parties which are the content of such an organ, which for all the reasons expressed above, if not as the result of a shadowy conspiracy, are in the pockets of the capitalist class and have to construct ideological appeals to the proletariat which inevitably conserve the fundamental wage labour/capital relationship. To be sure, the "alignment" required for socialism is precarious, the construction of mass participatory organs which wil probably be seen as real democracy against fake democracy (echoes of the current Spanish events) will not likely be fully revolutionary as in the expropriation of the capitalists, from the outset. There will be a power struggle here, a fight within a ring of fire, the maximum expression of capitalist crisis. The revolutionary outcome will be a product of the successful appeal of the revolutionaries to the wavering elements, the conversion of the radical reform seekers to the proletarian perspective, the pressure of masses of workers driven by circumstance, experience and the efforts of the revolutionaries to retain the delegates that express their historic interests against any quick fix compromise. Within this process, and prior to it, the parliamentary institution will lose its prestige, legitimacy and right to authority within a growing layer of society. This would seem to be the case already to a certain extent, abstentionism, lack of difference between the alternatives presented, corruption et al have already undermined the public opinion, and this process can only augment as the reality of capitalist crisis and the State's response continually augment the frustration of the victimised working class. Certainly violence cannot be discounted, but we generally recognise that it is the determination of the mass in the face of State violence which will crack the military who will split at having to kill workers who are organised by the councils. We do not plan on lining up and battling it out with the professional army, and although we will resist as best we can, we will endure their violence and they will crack. A good summary of how class struggle will evolve in a period of deep economic/social crisis and the absolute necessity of ensuring that workers councils have the political lleadership that is up to the task of winning workers to the necessity of overthrowing the capitalist state and replacing it with genuine organs of class struggle. What has been missing from the discussion up to now is the uneveness of working class consciousness and how this uneveness itself can contain many contradictory elements. I think this can be seen in both the events in Spain as well as what occured and is occuring in Egypt and Tunisia. It's this uneveness that necessitates the revolutionary organisation that is made up of class conscious cadre steeped in Marxist praxis. The cadre need to be able to intervene in day to day issues to win at first the most class conscious workers to a revolutionary perspective and through these cadres the rest of the class. It's this difficult but necessary task that is needed rather than worrying about parliamentry struggle.